The ultra-tough, lockable vault for storing hazardous chemicals and flammables. As well as exposing individuals to possible risk, failure to comply with with regulations relating to the Control of Substances Hazardous to Health (COSHH) is an offence under the Health and Safety at Work Act 1974. 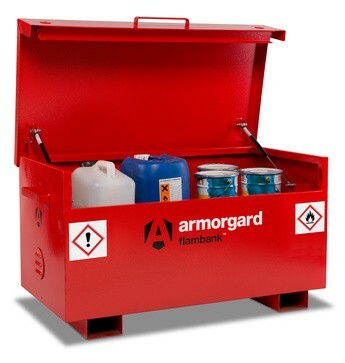 Built to the same high specification as our renowned TuffBank Armorgard FlamBank is specially designed to comply with all COSHH regulations, ensuring that your hazardous substances are securely protected 24/7. Available in 7 sizes, the FlamBank is ideal for use on construction sites, in factories and vehicles. Comply with all COSHH regulations Ideal for use on construction sites.